On Oct. 9 — barring uncooperative weather — Baumgarnter will leap from 23 miles (120,000 feet) above earth, and potentially reach speeds of 700 mph. If all goes well, Baumgartner will not only obliterate Joe Kittinger’s current freefall record of 102,800 feet, but have one hell of a story to tell when he’s older. Don’t even try to one up this guy, because he’s basically floating to space in a balloon and jumping out. But like anything of this magnitude, an insane amount of planning, testing and yes, even tech, is making Baumgartner’s attempt possible. An enormous helium balloon filled with all kinds of gizmos will carry the man up to 120,000 feet in about 3 hours over Roswell, New Mexico (fitting, no? ), where he will then jump out. If your throat drops into your belly while standing on your local Y’s high dive, imagine peering at the ground from 23 miles up. That’s insane. 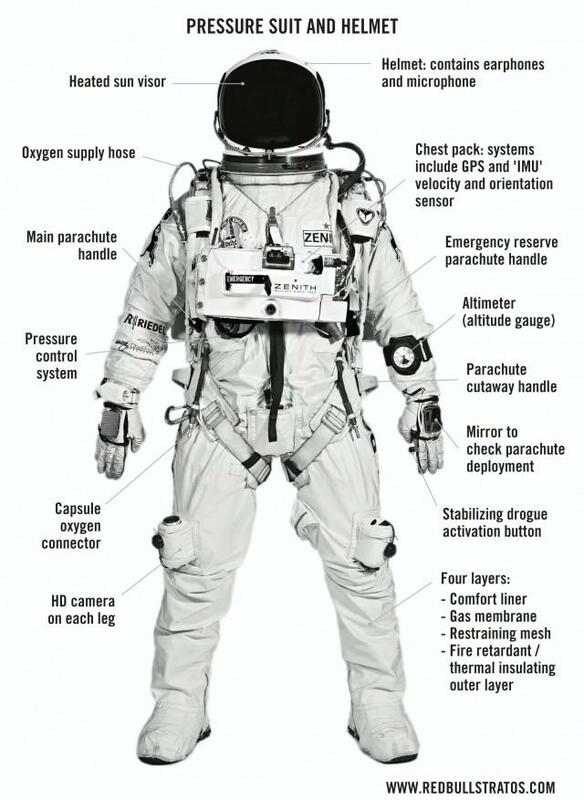 To even attempt the jump, Baumgartner will need to wear a suit that even Tony Stark would be scared to put on. You can see a nice little infographic Red Bull Stratos put together: four layers of material, pressure control system, capsule oxygen connector, and a number of other controls. 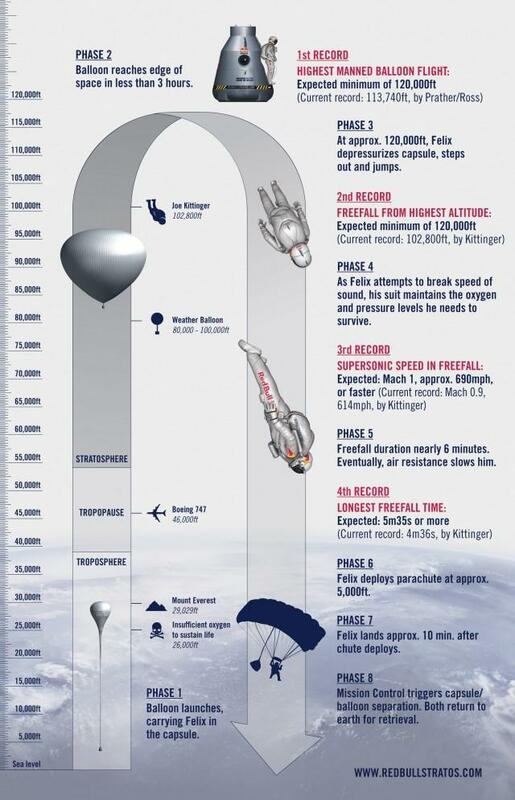 His freefall duration will last nearly 6 minutes, where he will finally deploy his parachute at 5,000 feet — a height us normal people might jump from. 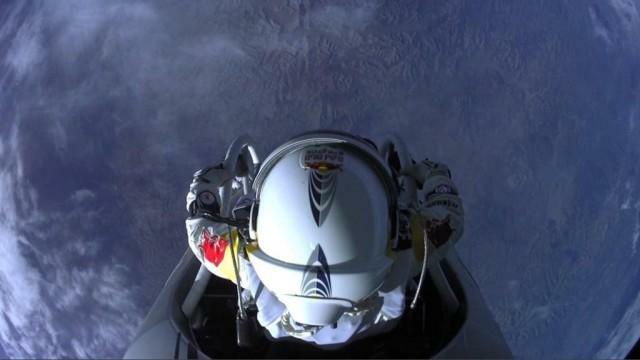 I guess for Baumgartner, who began skydiving at age 16, the 23 mile jump will be normal. Red Bull will live stream the historic event live starting at 8:00 a.m. EST on Oct. 9, so if you’re on the west coast, you better set your alarms. UPDATE: Due to questionable weather, the jump has been delayed until Wednesday morning. UPDATE #2: The jump is actually going forward. Stay tuned for more information.